Product: 74307 Huffy Portable Basketball System with a 52 inch polycarbonate backboard and 1 x 2 inch steel frame and board pad, Pro Slam breakaway rim, Helix height adjustment system, and 40 gallon power move base. You can describe this basketball system in one word, convenient. As portable as they come, this system has four wheels on a power move base which does not require the unit to be tipped forward to roll. You only need sand or water to fill the 40 gallon base in order to play some ball, no cement required. Easily adjust the height to fit the players or the practice. There are even built-in holders to hold things such as wallets, rings, keys, etc. Enjoy! -Infinite height adjustment activated at the push of the thumb button! Made possible with the Helix height adjustment system. 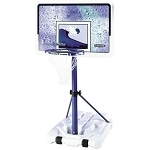 The 74307 Huffy Sports Basketball Hoop generally ships via an LTL freight carrier. Dimensions: 55" x 42" x 16"